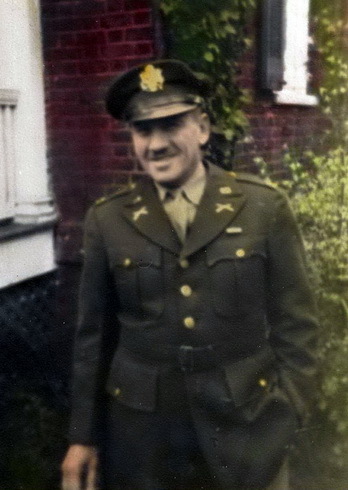 The first US soldier to lead the military regime in Garmisch-Partenkirchen on April 29, 1945, after the end of the war, was Herbert L(evere) Snapp, major in the US Army. With the 10th Division ("Division Tiger”) and their tanks he had come from Schongau, Oberammergau, Ettal, Oberau, Farchant to City Hall in Garmisch-Partenkirchen in the early evening of that day. There he and other US officers from a panel of local citizens, including Georg Schütte, until 1933 2nd Mayor of Partenkirchen, the place formalfy handed over. The Second World War was thus completed for the Olympic and health resort Garmisch-Partenkirchen. The consequences of the war and the dictatorship should feel the place but also in the following decades. Snapp was born on December 21, 1901 in the small town of Champaign County, Ohio, to Leonard and Clara Bella Snapp. He was a descendant of German immigrants with the name Schnepff. His father worked as an engineer at the Pennsylvania Railway Company. Herbert L. grew up in St. Paris, a small town near Champaign County. 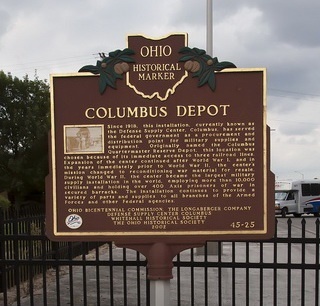 He attended the East High School in Columbus, earned in 1924 the Bachelor of Science in Agriculture at Ohio State University and later the Master of Education. In 1929 he married Vergie Hammack from Virginia, in 1931 daughter Nancy was bom. Until 1940 he was a teacher and school councelor in Union County, Ohio. During this time he served in the National Guard of Ohio. 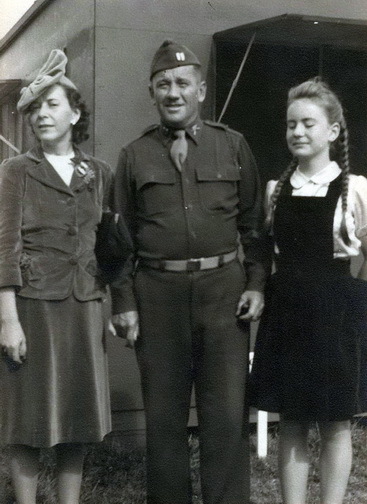 His other career: From 1940 to 1944 he served as a captain in the 166th Infantry Division of the 37th US Division in the Army of the United States. 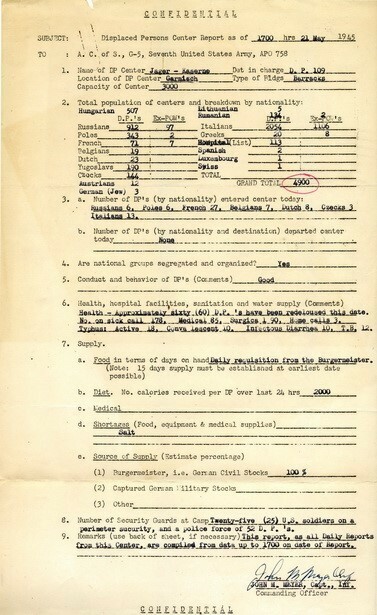 With the mobilization for World War II, Snapp was assigned to the Fort Benning Infantry Schoo! and the Military Government School at the University of Virginia. He was thus prepared for his post as military governor in Germany. In June 1944 he was embarked on the "Queen Mary" towards Europe. From Scotland he arrived in September 1944 - via Utah Beach - to France. 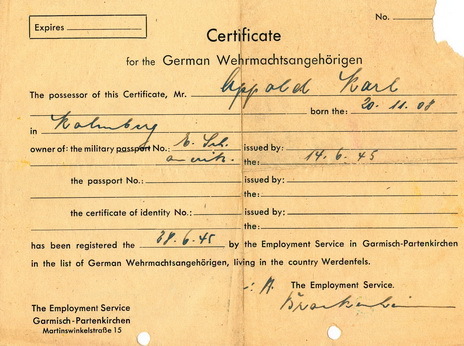 In March 1945 he entered German soil. In the European theater of war he was in action in England, France and Germany. 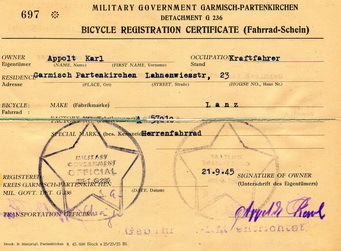 At the end of the war and after the German collapse, he was ernployed according to his training in the respective military government in the districts Heppenheim-Münsingen, Garmisch-Partenkirchen (30 April to about mid-June 1945), Donauwörth, Deggendorf, Passau and Schongau. In 1947 he was promoted to Lieutenant Colonel. In December 1945, he left Europe via LeHavre (France) and returned to the United States. 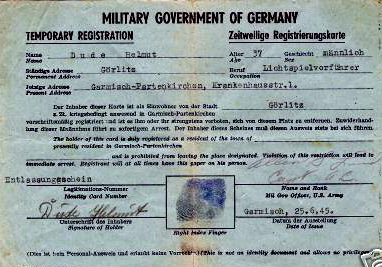 Later he was reconvened and returned to Germany in March 1946. Despite the atrocities of war and the obvious opposition to the Nazi regime, Snapp had no hostite attitude towards the people he met in Garmisch-Partenkirchen. His grandson writes: “Despite the horrors of war and an enemy of the Nazi regime, Snapp had a respect and affection for the German people. As a military govemor his chief desire was to re- establish order and a general harmony so that the people coud rebuild their great country with their own talents and laboratory, and heal from the wounds of years of terrible warfare." 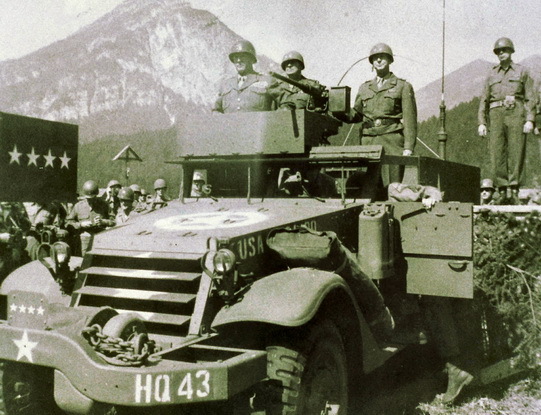 Major Snapp remained as a military govemor until mid-June 1945 in Garmisch-Partenkirchen. He is remembered because in the first plight of mankind he has worked for much that was urgently needed. Freedom of the press and the freedom of religion and the food supply of the population were of great concern to him. 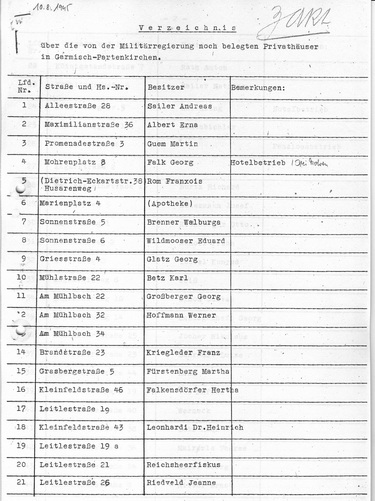 For his county Snapp had shortly after the end of the war Dr. Franz Fux appointed provisional district administrator: "He is responsible for the actions and the security. He has to act according to the Orders of the officer of the military govemment, Major Snapp." 27 June 1945 Snapp was replaced by Captain Allen S. Lund. In the same year followed the military governors Major Kenneth A. Mc. Intyre and Major Charles A. Heyl - four top US representatives for the small district of Garmisch-Partenkirchen in just one year. The story behind it woutd still have to be investigated - presumably it has to do with the disappearance of the Reichsbank treasury, which had appeared in the district just before the end of the war; First he camped in a Mittenwalder Wehrmacht barracks before he was then buried in a mountain on Walchensee. Again and again, this "Nazi treasure” haunted the district. As late as 2016, a Dutch speculator with heavy equipment was dug on a Mittenwalder road afterwards. But without success. Snapp was able to prove his positive attitude to the press after just a few days. Although the military government of the US occupation zone had ordered the cessation of all press organs in their area of responsibility, the Garmisch- Partenkirchner Tagblatt with Snapp's approval couid be printed almost unhindered for more than two months. Under the heading "Heimatnachrichten" it was announced: "Our sheet experienced in these days record editions. We released the last numbers in an edition of 12,000 pieces, while the normal edition of our sheet was 8,000 pieces." Major Snapp explained, "the newspaper was good " and the Garmisch-Partenkirchner Tagblatt couid continue to appear until June 4, 1945, despite a conflicting decision by the supreme military agitation. Lucky for the readers of that time and for todays local historians. From the point of view of Alois Adam, editor until 1937, the events took place in this way: On Sunday, April 29, 1945, the American troops occupied Garmisch-Partenkirchen. 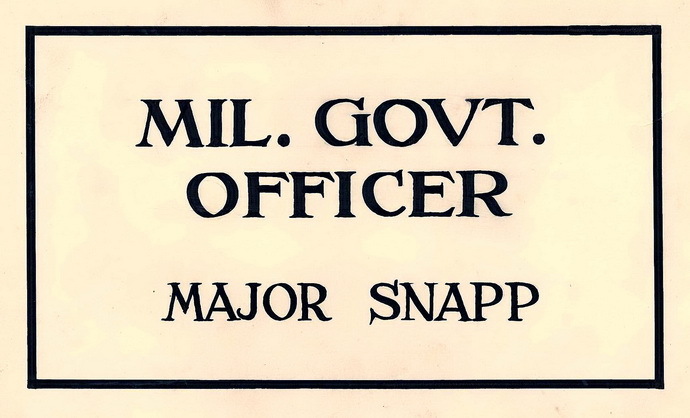 The district governor was Mr Major Snap. The business of the district administrator was the Oberregierungsrat Dr. Fux transmitted. He obtained permission from the US governor to allow the Garmisch-Partenkirchner Tagblatt to continue publication. On Wednesday, May 2, 1945, the newspaper came out again: "I took over again the writing guidance, which I had delivered on the 1.Oct.1937 at the to me of the district administration presented to writers Brunner. 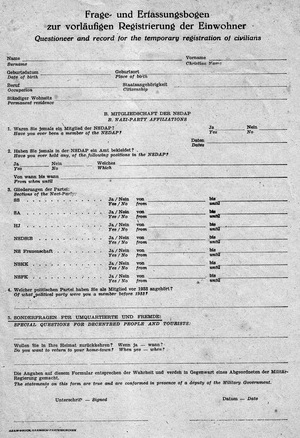 The first numbers of the Tagblatt published under the American occupation were censored, later the censorship was almost completely eliminated. I found many enthusiastic and capable employees. The content of the newspaper was also described as good by people of the military govemment." Another bright spot after years of darkness was the lifting of the blackout that had been used to protect against air raids during the last six years of the war: "We take it as a good symbol that the Americans brought us back this light and our place and our apartments may shine bright again." 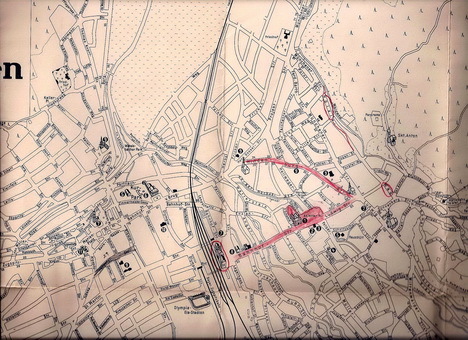 The encounter between the occupied and the occupiers was at first quite problematic. In his first report to the mifitary government the district council noted the following about the views of the Germans on the Americans: "The invasion brought... many disappointments. tt may be due to the fact that a large part of the German people had no idea of what a crew naturally entains for conversion and restrictions for the population. On the otherhand, one can not ward off the impression that the Americans came to Germany with a very preconceived opinion. In the treatment between Nazi and Nichtnazi one can hardly detect a difference." About the food and security situation it was in June 1945 in the third month report said: "The district of Garmisch- Partenkirchen is a particulariy large deficit area for all kinds of food, the food situation is through the accommodation of many evacuees, through here in KLV camps children and the many foreign workers who still remain here are extremely tense.“ However, the American military govemment employed in the district often supports the population in the procurement of flour. General security was threatened by the tooting of former forced laborers. Snapp had invaded with his US division on 29 April, barely two weeks later, the Garmisch-Partenkirchner Tagblatt put him under the heading ”Our new Ortskommandant" in front. The handing over of the market Garmisch-Partenkirchen by Georg Schütte, 2nd mayor in Partenkirchen until the seizure of power by the National Socialists, touristic director Max Werneck and lawyer dr. Carl Roesen. The role of the interpreter had been taken over by Professor Alexander Cap, a world-renowned English teacher at high school. Georg Schütte (SPD) was appointed acting mayor and Bernhard Lödermann (BVP/CSU) the 2nd mayor. The former site elder Colonel Ludwig Hörl was deposed. Major Herbert L. Snapp of the US Armed Forces took command of Garmisch-Partenkirchen. He directed the appointment of mayors and local councilors in the first session of the new municipa! administration in the town hall. A first wise decision was the appointment of the two acting mayors. Schütte was a cosmopolitan politician and a respected opponent of the Nazis and Lödermann had four-year experience from the United States (1922-1926 in Milwaukee and Oakland) brought. Snapp spoke offhandedly, "You could see that his words came from the heart." He said, among other things: "This is my second visit to Germany. I came for the first time in 1936, but the current visit is under quite different circumstances. I saw and heard in my home country what was going on in your country and I knew that one day I would have to come back to Germany as a soldier." A second topic was war and peace: "America loves freedom, it loves peace and hates war. And that is why we fought so bitterly: Our coming has destroyed and driven out our enemies, so that your country can be happy again. Many Americans have given their lives and have had to die for this to happen. We came as conquerors, as victors, but not as oppressors. The mititary government was used to instruct, teach and not dictate your government." Finally, he addressed directly to the members of the local council: "The lords of the local council face today difficult problems and tasks. In this Situation you need good men. You and your leaders will have a big challenge in creating a safe, secure future. Great responsibility is entrusted to you and hard work awaits you." He was particulariy interested in the new religious freedom: "Democratic America approves religious freedom for every confession. The church bell, which may later be cast from cannon metal, may ring in Garmisch as they want. Nobody will forbid them. We in America have a Liberty Bell that is sacred to us. When we gained our freedom, we rang it so hard that it jumped. We were so happy about freedom and independence. And now you all stand by your mayor and pray to your God for a better Germany, which will again be respected among all peaceful nations." These were words that allowed the discouraged and disappointed to hope. There were enough worries and problems. For example, the number of displaced persons in the community, ie those who came to the country as forced laborers or as former pnsoners of many concentration camps. They had to be housed and cared for, not an easy task for the US governor and the German local politicians. Here are the numbers: Total 4900 from 17 countries. In these first days of peace, the great peace parade took place on May 9, 1945 at the Town Hall Square Garmisch- Partenkirchen. The Garmisch-Partenkirchner Tagblatt reported: "The war wins in the end who seeks to achieve great goals by great means, and lose him who iives from hand to mouth and pursuing instantaneous successes." Goebbels wrote this sentence on August 16, 1942 in his weekiy article in "Das Reich". Garmisch-Partenkirchen was convinced on May 9th that the master of the Propaganda lie was right this time. The last battle was over, the Allied Commander-in- Chief had won it. The indigenous people marveled at the “great resources" that helped achieve the perfect victory: "For hours, behind the Harley-Davidson motorcycles of the military police were the endless columns of various types of tanks - each equipped American military music. 2 Generals and a colonel took off the parade. Garmisch-Partenkirchen showed its white-blue flags hidden for years quite openly and proudly. The native population wore festive national costume: Everything breathed more freely, if not exactiy carefree, the air of freedom gained from the threat of war, in a human community with yesterday's opponent." Major Snapp squeezed on the eve of the "VE-day" in a speech to district administrator, mayors and entrepreneurship his hopes:’ "This day should be not only for the Americans, but also for the Germans a day of joy and relaxation. At the big parade, the Germans will no longer see the grim faces they have been at war with but friendly, smiling faces. The Americans will be happy if they see equally friendly faces among the Germans. Also a rich flagging of the houses with Bavarian flags is desired.“ The occupation authority would do the utmost to help over the difficult groceries situation: "When finally under salute shots the American flag was raised as a sign of the occupation at the city hall, all felt the world-historical meaning of the hour." 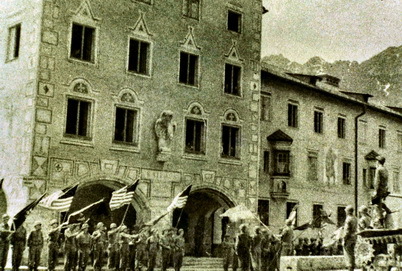 Snapp had previously urged and encouraged churches and clergymen to ring the bells and show flags on the occasion of this day - but that eamed him a reprimand from the Commanding General of the 10th US Division. He was not dissuaded that his actions hed been correct. Snapp was visited sevral times by Richard Strauss. The famous composer insisted on composing a play for Snapp's daughter Nancy Lee. During his visit to Oberammergau, Snapp stated that the players of the last Passion Play by the bank, induding Maria, had been Nazi märnbers. Only one not: Judas. 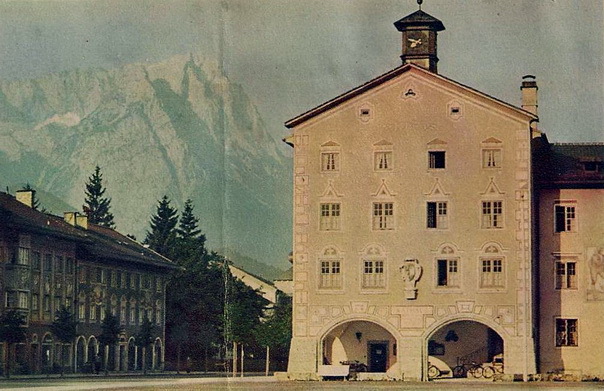 During the visit of the Schnitzschuie Garmisch-Partenkirchen under its director Otto Blümel he could not determine a National Socialist influence. Therefore, he allowed the immediate reopening. Thus, the Schnitzschule became the irst schooi of its kind, which was able to resume operation shortly after the war. 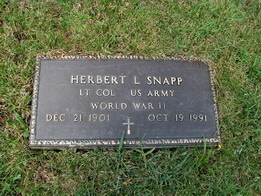 Until the end of June 1945 Herbert L. Snapp remained as a military governor of the district. He was succeeded by new Governor Captain Allen S. Lund. Through an interpreter, the new governor pointed out "that the mayors of the district are responsibie to him for everything they do, but also for the acticns of the peopie themselves. In the administration, the mayors of the smaller commuriities are subordinate to the mayors of the larger towns, and these in turn are the new District Dr. Ritter responsibie for whats going on in public-"
Snapp retumed to Columbus, Ohio after the end of the war and worked for the govemment in a US Army supply center. 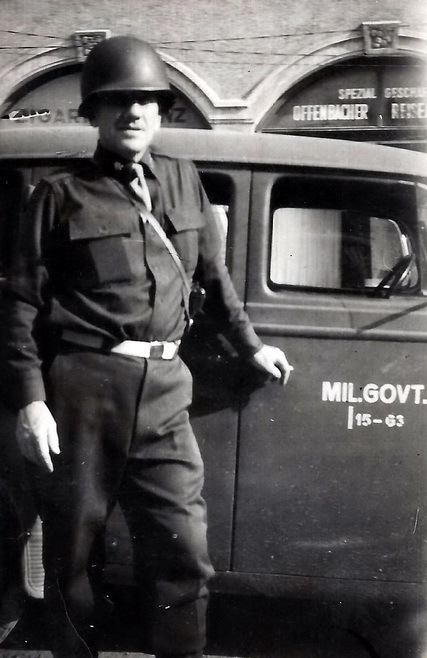 He resigned from military Service in 1957 as Lieutenant Coronel, in the early 60s, he left the Civil Service.